Have you ever wondered how those hawker centers, coffee shops (煮炒摊 – “Zhu Chao Tan”) and Chinese restaurants always served us with crunchy and yet tasty Chinese Greens with garlic oil and oyster sauce? I used to think that all I have to do was just drizzle some oil and oyster sauce over the cooked veggies. How wrong I was!!! Now that I have learnt from my mistakes from those who have “perfected” this dish, I am sharing with you some techniques and the recipe on how to cook this dish so that it is crunchy and fresh. I love this dish as you can use any green leafy that suits your family’s taste buds. The commonly used vegetables are choy sum, kai lan, baby bak choy or lettuce. This dish can be served alongside Chinese roast meat (Siu Yok/Char Siu) or Clay Pot Chicken Rice as mentioned in some of my earlier posts or any other dishes of your choice. 300g to 400g of green leafy vegetables. Heat frying pan with oil and add chopped garlic and stir fry until it turns light brown. Pour the garlic and oil in a small bowl. 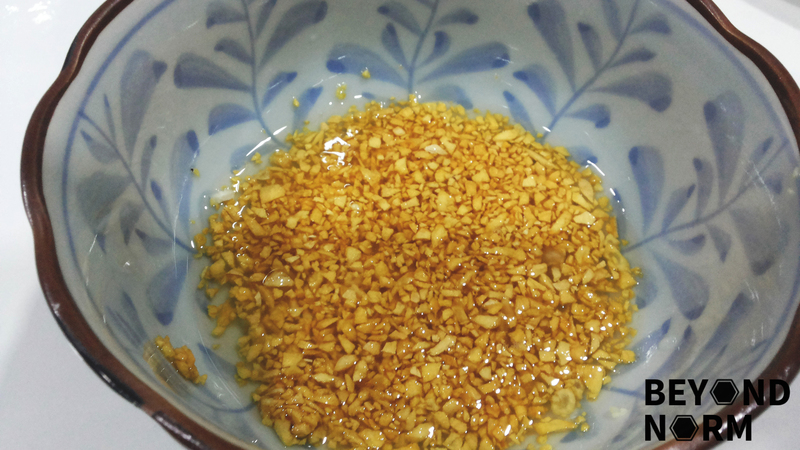 The garlic will continue to cook for a little longer in the bowl of hot oil until it turns a lovely golden brown. Heat up a pot of water and bring it to boil. Add two small drops of cooking oil into the water. Add your vegetables into the boiling water and quickly blanch them for about 30 seconds or till they turn slightly wilted. Transfer them out and drain off the excess water from the vegetables. Arrange the vegetables on a plate. Heat oil in a frying pan and then add all the ingredients. Stir to combine all the ingredients well. As soon as the sauce heats up, remove from heat and drench the sauce over the blanched vegetables. Top the vegetables with the garlic oil and serve immediately.